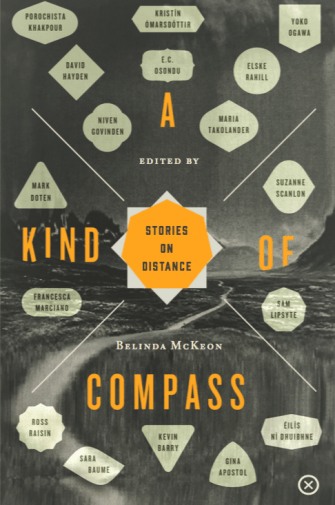 A Kind of Compass: Stories on Distance, Belinda McKeon, ed. Juxtaposition performs a sleight of hand. Presented with a collection of stories I might find the arrangement conducive to comparing them or I might not, but the possibility of not seeing the stories in relation to one another at all has been precluded. The seventeen writers (ten women, seven men) anthologized by Belinda McKeon in A Kind of Compass hail from Ireland, Iceland, Iran, Italy, Japan, Nigeria, the Philippines, the U.S. and U.K., and Australia. They write here of island villages, great cities, unspecified countries, possible futures, deep space. Some of their characters undertake distance. Others are overtaken, overcome, bound by distance. The short story is “made out of distance,” McKeon writes in the introduction, “out of the problem” of catching the essence of a life in a few pages. A problem not unique to the short story, but for the project of this book the short story—a juxtaposition of short stories—perhaps uniquely offers an opportunity to simultaneously explore its subject and elide its subject’s constraints. In Porochista Khakpour’s “City Inside,” “[f]or the first time in his life, Henry was living in a famous city” where even his apartment building has “a well-known history.” In Ross Raisin’s “Holy Island,” Elfrida sees “the thickening membrane of water over the flats” as the tide runs, and knows “that the island will soon be cut off, freed.” Characters here move in awareness of where of they are not, of known space’s boundaries. Reading, I moved similarly, alongside characters, partly in mind of others. The proximity of narratives converged divergences. There is some calling out which she cannot understand, and her gut hollows at the sudden thought of her father—his opinion of these migrants; these landsmen. Elfrida’s bond with her father at sea reposes in definitions he has outlined for how, hailing from the island, to conceive of oneself in the world. The consequences, within the story, are less physical than existential; less what happens than the conditions of possibility. An island self is fortified, limited. In Francesca Marciano’s “Big Island, Small Island,” the narrator—Stella—is the new arrival. She takes a plane (there are understandably a number of flights in A Kind of Compass) to a small island off the east coast of Africa, “a last-minute diversion” from a conference itinerary, to visit a former lover who’d left Italy years before. Stella travels with the contemporary ease of planning by travel website; she finds the ex’s phone number by Googling him. The effort of traversing distance remains, however; she goes to “give this exhausting trip a more significant purpose.” The island refuses to be as the arrivals would like. Stella’s seatmate on the flight finds his plans for a resort unwelcome; Stella finds her ex busy, and no view of the sea. It comes as shock to her that she hadn’t been thinking of the ex until there was the opportunity to see him, hadn’t missed him until hearing from him that he didn’t miss Rome, or their old circle. The destination alters the sense of where there is to return to; “home has never seemed so blurred,” she writes. The changes to Stella and in many of the stories in A Kind of Compass are no less irrevocable for being in perspective, not physical. (Viscerally, in the page and a half of Niven Govinden’s “Animal Heart,” philosophical and physical consequences on the protagonist combine.) Several stories are set after disasters that happen offstage to others. There can be a balm in the prospect of distance. Distance can be as useful to the storyteller as to the restive soul. In Sara Baume’s “Finishing Lines” the meticulous observations of a trip to London put enough unfamiliarity between the narrator and her family for homeward thoughts to bring consoling sadness. What money I have is by now so comically eked out and in such tiny dribs that my clothes are not good at all and as certain as the weeping callouses on the balls of my feet is the need for new boots or for a good pair of trainers at least. Distance allows refusal, suspension, escape. I was surprised with several stories to turn a page and find the title of the next story. Absent the spine of a book-length theme to rib from such abruptness might seem insufficient, too little made of the distance covered, but in A Kind of Compass, in the company of many stories, the effect is rather of concurrent experiences nearly concurrently experienced, the distances between them collapsed. The short story allows for that, for views cut off, the reading mind induced into making room for referred expanses beyond the time spent and related on the page. A Kind of Compass begins and ends with stories contemplating space travel. Maria Takolander’s outbound space traveler contrasts the space in her dreams to her compartment’s “clear finitude.” The compartment is closed against the “obscene weight of the void outside,” and so she looks inward. A fitting final clear finitude for this fine collection of them, conveying more of lives than they have room for, containing them against the enormity outside. SARAH MALONE’s writing has appeared in The Awl, The Collagist, The Common, The Rumpus, PANK, and elsewhere. She was a Juniper Fellow at the University of Massachusetts Amherst and is at work on a novel.